Couldn't help but plug this one. This was one of the surprise movies to entertain us at the last Frightfest. Shades of Asian Horror, mixed with the kind of stuff you'd associate with grindhouse classics like Patrick and even maybe The Medusa Touch. And with influences like that it'll come as no surprise that a great deal of this film is bloody brilliant, if you excuse the pun. From Paddy Breathnach, the director of Shrooms, comes this nerve-shredding new horror with a star-studded cast including Arielle Kebbel, Sarah Carter, MyAnna Buring, Andrew Lee Potts and Martin Compston. A group of medical students at Forthaven General Hospital study hard and party harder, until a cruel prank accidentally puts the hospital's creepy caretaker into a deep coma. But when Catherine (Arielle Kebbel) tries to revive the degenerate loner with an experimental drug, she instead sends his brainwaves beserk. It’s not long before Catherine’s friends are picked off one-by-one in a spree of sick kicks as the ultimate out-of-body experience ushers in a bloodbath of brutal revenge. 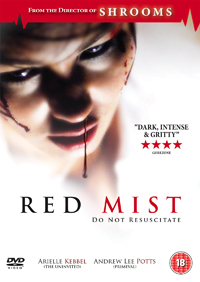 Red Mist follows a group of young medical students, including Catherine (Arielle Kebbel, The Uninvited) and Kim (Sarah Carter, Skinwalkers) who administer a powerful and untested cocktail of wonder drugs to a coma patient. The patient is jolted into a startling out-of-body state, allowing him to murderously possess each student in turn. Winner of eight international film awards, including Best New Director at San Sebastian, and a Special Award at American Independent Film Festival, Paddy Breathnach is not only critically acclaimed but also a box-office hit with his previous film Shrooms banking nearly $2million at the box-office. Andrew Lee Potts is seriously dating Hanna from S Club 7. That's the cute blonde one that's on Primeval with him now. 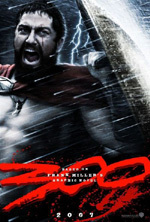 Two hours of strapping men proving how manly they are by growling and shouting and fighting against inconceivable odds. Plural, as in 'more than one', and no aliens in sight.